Pansies vs. violas: What’s the difference + which is better for you? As we head into the fall season, our outdoor gardens have to shift and transform with the weather. Summer blooms are beginning to fade, and the time has come to bring in some cool weather flowers! 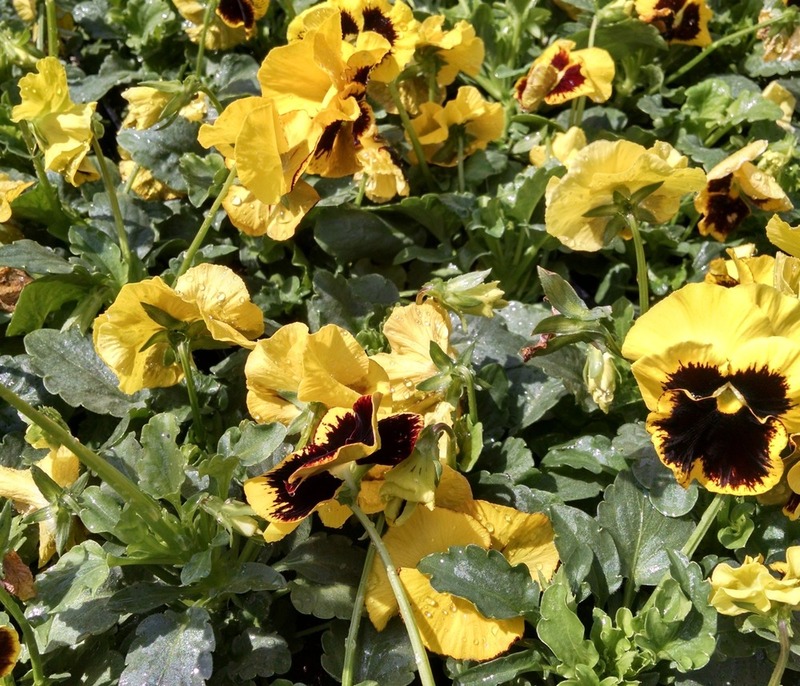 Pansies + violas are some of the toughest cool season annuals. If they’re planted in the early fall, they’ll begin blooming that season, through the winter and into the spring. So what are the differences between pansies + violas, and which will work best in your garden? Pansies at Garden Supply Co.
Now is a great time to re-fresh those tired container gardens and add a pop of color to beds and borders with fall and winter blooming pansies. As compact, low growers, pansies are ideal for edging and for squeezing between rock walls and paths, and are an excellent choice for containers, baskets or in-ground beds. With tons of color varieties to choose from, these hardy annual plants will provide vibrant color in the landscape now through the chill of winter and early spring, fading only when the heat of next summer sets in. An added plus? They are super easy to grow, and we have tons of fresh, beautiful pansies arriving now weekly at Garden Supply Co. The holidays are now officially behind us, and the chill drear of winter has set in. Although it's been a fairly mild season so far, this past week has really taken a turn for the cold. With peek planting time still a few months away, it seems like spring, and all the flowers and new growth that comes with it, is a long ways away. If you're craving some color to chase away the winter blues, never fear. We have lots of gorgeous plants that are in bloom now that will provide some much-needed cheer all winter long. Hellebores are perennial and largely evergreen. Their flowers provide color and interest in the shade garden when other plants are dormant. In addition, their leaf structure is interesting enough to make them a foundation of the shade garden year-round, even when their flowers are spent. Hellebores are also deer resistant and somewhat drought tolerant. We have several beautiful varieties to choose from. Of course one of our favorite plants for winter color is the pansy. Pansies come is a wide variety of colors, sizes, and shapes and work well in beds, borders, and container gardens. We have several carts full of the 4" pots. If you're looking to add color, flowers, and fragrance to your winter landscape, try the Winter Daphne. Winter Daphne has rosy-pink flower buds that open to white with fragrant flowers that bloom in winter and early spring. Reaching 4 feet tall and wide, Winter Daphne is beautiful against a wall or near a patio or deck where its fragrance can be appreciated. For blooms indoors, we also have many options to choose from, including these gorgeous Paperwhites. For those DIY folks, we have plenty of bulbs for planting or forcing indoors. Or for instant gratification, choose from our pre-planted selections. These make a great gift when paired with one of our many decorative plant stakes or garden art. Or add a few African Violets to your kitchen windowsill for an instant burst of brightness. And we have tons of stunning plants to choose from in our indoor garden, including some really incredible orchids. As always, we are here seven days a week for all your gardening needs. Stop by and see us today! Hello everyone! Take just one small stroll through the Garden Supply grounds and you will fully believe that spring has truly arrived. Everywhere you look you'll see flowering annuals, perennials, shrubs and trees. If it's blooming, we're sure to have it. You need to come on over and take a little peek. We will have you itching to get outside in your gardens and get dirty in no time flat! One perennial already blooming is the Lenten Rose, a mainstay of many shady gardens. This wonderful plant bears some of the longest-lasting flowers of the year. If you already have some of these in your garden, now is the time to trim off last year's foliage that may be hiding under the new leaves that emerged this winter. Removing any leaves that look shabby will make the new foliage and blooms look even better. Pansies, another bright favorite in the landscape, are still going strong. We just got in a new shipment this week. If you have pansies that have overwintered with you, they would benefit from a dose of fertilizer right about now. These spring-like temperatures will encourage new growth from their winter slump. Pinching off any spent flowers will help, too. This will give your old pansies a fresh new start. They should look good until mid-May. Look at some of our other blooming beauties. Wouldn't this stunning Camilla be a showpiece in your home landscape? Come check out all the gorgeous varieties we have for you. And if you're looking for a real Southern Beauty, take a gander at these amazing forsythia in bloom. I would guess these plants are at least 8 feet tall already, and bursting with bright yellow color. Just gorgeous! But then, everything is gorgeous these days at the garden center. Hope you'll stop by and visit soon!